Oh winter! Why are you so long? Doesn't matter if the groundhog has seen his shadow or not today, it will be months before we see anything green here. After reading Grow Great Grub by Gayla Trail, I'm itching to get my hands back into the dirt. Last year was my first try at vegetable gardening and I was pleased with the results. I can't wait to do it all again. Grow Great Grub isn't just a pretty looking gardening book. It's a practical how-to book for gardening in small spaces. You don't need acres of land to have your own yummy fresh veggies. In fact all you need is a sunny windowsill and you got yourself a salad. Gayla Trail is an advocate of urban gardening. The first chapter is called "Growing Anywhere and Everywhere." That should tell you something. She believes that if you can stick a plant in it, it's fair game. You just need to know what you can grow successfully where and you're all set. She also believes you can do it all without the use of chemicals. Gayla Trail gives tips on how to improve your soil, grow in containers or raised beds, choose and start your seeds and take care of them from seedling to harvest. To make sure your veggies get to the table, Trail tells readers how to defend plants against disease and pests with companion planting and encouraging predatory insects. And for you DIYers, there are projects like building your own compost bin and "Upside-Down Tomatoes" rated with a difficulty scale. Once you've grown all this great grub, what do you do with it? There are recipes for preserving and canning your veggies so you can enjoy them all year long. 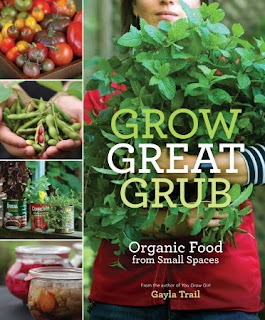 So except for making me long for spring and causing a bad case of cabin fever, I loved reading Grow Great Grub. Highly recommended for anyone considering growing their own organic vegetables (really, it's not that hard, if I can do it you can). You can find Gayla Trail on her site You Grow Girl. I did my first veggie garden last year, too! I should start looking into how to prep for it this year. I'm so excited! I think this year, in the city, I'll focus on an herb garden. And at my parents' house, I'll go for the veggies, like tomatoes and eggplant, I think. COOL! I love stuff like this, and I really want to inundate our space with veggies this year. What a great book - I'm an avid gardener and am still eating last year's veggies! We always had a garden when I was growing up and there's nothing better than homegrown vegetables. Good luck with your garden. cj'alhafiz- I'm staying away from Facebook Farming. Too addictive. Aarti- I'm not a big fan of eggplant but good luck. Kathy- I loved eating peas right of the vine. I belong to a CSA, but I still grow tomatoes and herbs. I'll have to take a look at this to see what I could grow in containers on my deck. sounds like a good read. I started with a tiny garden this past some, a couple of herbs. I used to have raspberry plants, but the berries didn't develop properly. only one or two pips per berry. I took them out last year and plan to put other veggies there this year. Well, since my daffodils are almost ready to bloom here in Seattle, I guess it will be time to put in our little garden soon! ;) I had my first taste of cranberry beans last year and LOVED them. The produce stands only carry them for a short while, so I need to make sure to be looking for them next summer. Thanks for spotlighting this book--it seems like a great resource. Just the cover of the book makes me want to have a garden and eat some fresh veggies. I'm definitely going to buy this for whenever I live somewhere where I can grow some greens. I love fresh veggies and fruit.